Anyho. I spotted this gizmo today, very bling bit of equipment, but have a few concerns, just thought I would ask the old saltys what they thought. 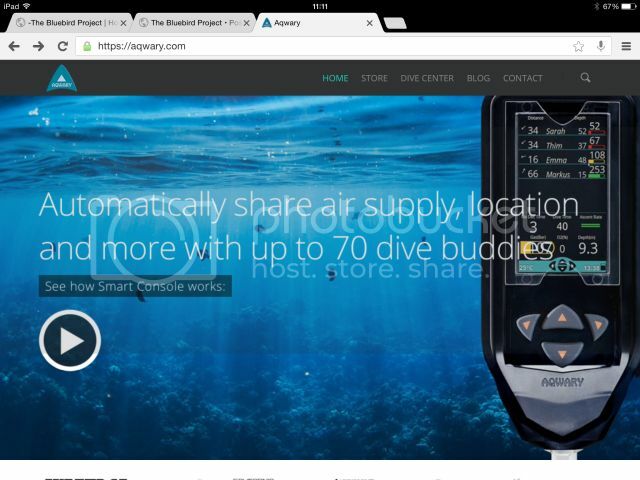 Basically it is a smart consol that interlinks with up to 70 other systems (usually divers) under water the data stream can be tweaked to your needs but one facility is that it tells you who has what contents in their bottles, and will even direct you to the diver (In an out of air situation) but that is the tip of the iceberg ! My concerns are that is it not a bad idea to have all your eggs in one basket ? Your depth contents, the lot ! All in one electrical device which, should there be an error or failure, could land you in the clarts somewhat ? Also is the system not redundant given that you and your buddy should be close enough to be able to get air if needed (which surely should not happen) also your buddy would need the same system, to me my question would be is it worthwhile ? And at 800 USD it is not a cheap bit of kit ! Bling though......very bling indeed ! Thing I like is you can programme it to do loads of different things... All mind you are useless if you adopt correct dive procedures. A diving thread- good idea! All you need up to about 100ft of water is the air diving tables in your head, a watch and a functioning contents gauge. Not sure I'd like a gizmo that drew me towards the numpty that was running out of gas... If he's that far away you weren't diving with him in the first place. That's kind of my point... Good if your running a dive school or operation where you need to know where everyone is etc. Can you imagine being mugged by 70 divers for your air !? Me personally I will stick to my normal stock consol with compass... My watch... And D timer for keeping track of my dives. I love gadgets, but no thank you. You should never have an out of air emergency, unlesss it's an equipment malfunction, in which case I would be looking for the nearest diver, not some fancy gauge to see who is closest. Al the consul warns you when your contents are low and the probe is supposed to be 360 deg line of sight 100m range but yes if your in a wreck behind a rock or on a great whites belly your snookered. If money was no object what dive related bling would you take with you on a dive ? I prefer the approach of the tech-diving community where every dive is planned and executed as a solo dive and if there happens to be someone around when it goes wrong then it's a bonus. It's infinitely safer than relying on someone else because more often than not when it goes wrong for you it goes wrong for the other bloke too. I've seen very few equipment failures but lots of getting lost, poor weather, strong tides, lost viz and, of course, the other side of the coin is that if the numpty next to me makes a balls of his dive I don't want to be risking my life to sort him out. Richie wrote: If money was no object what dive related bling would you take with you on a dive ?